RE: [Chrysler300] Paint code question. PPG/Ditzler agree: Y= Rosewood Poly. http://www.jholst.net/paint-codes/paint-code.pdf Not sure about the last character, the 6. Is this a Chrysler with a vinyl top? In 1964, Salons & Silver Editions had a trailing 9 in the paint code to signify a canopy molding and black vinyl top. Maybe a convertible with the 6 designating a color of the top? Column 28 on the ’62 IBM Card has preprinted for the last character in column 28: “ STYLING-CONVERTIBLE TOPS” We note that a “1” here indicates roof and lower body are all the same color—and a “2” indicates a two-tone car. If a two-tone, the first letter would be the roof color and the second letter would be the lower body color. In 1964, a “6” in column 39 signified a black top. The top color is not reflected in the PNT code for 1964’s. So, John: What is the line and body type for that Rosewood beauty? Subject: Re: [Chrysler300] Paint code question. 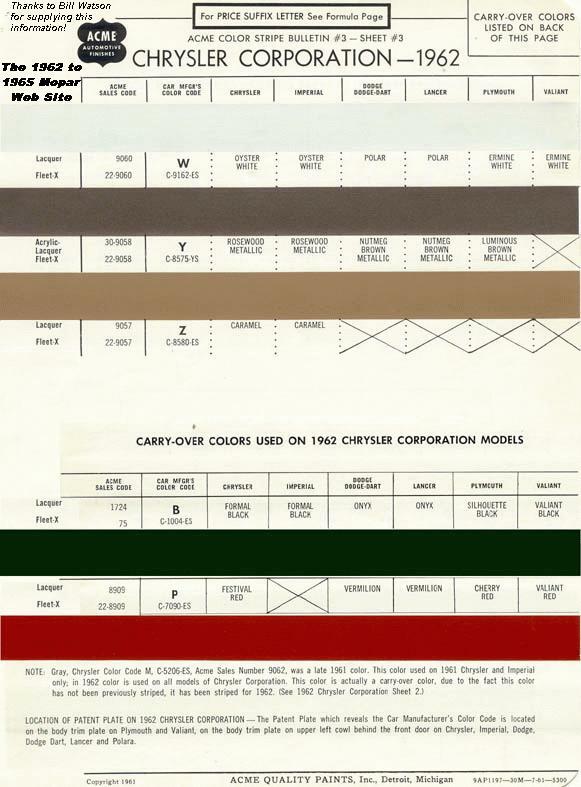 1962 Chrysler YY6 paint code. What is the Color for this code? Online it seems to indicate tan but another source says red. Prev by Date: Re: [Chrysler300] Paint code question. Previous by thread: Re: [Chrysler300] Paint code question. Next by thread: [Chrysler300] Barrett jackson letter cars.